2 guys walk into a bar, and talk football. Sounds pretty standard, right? Well, Destructoid.com's Samit Sarkar spoke with Madden 10 Lead Designer Ian Cummings to get the low-down on what to expect! NFL fans will be excited to learn that Madden 10 has an "NFL Franchise" system, where 32 people join up for some online rumble time according to real NFL schedules. Though this isn't exactly co-op, new innovative ways to bring players together is fine by us! Co-op is brought up as a way to bring new gamers into the mix, and to be honest, this gamer is much more interested in a sports game that can be played Co-op with a buddy! Co-op was the corner stone of this installment of Madden, and we're excited to see this implemented (finally). They mention starting with 2 players to work full team co-op into the game sometime in the future, 11 player co-op would make for one amazing Co-op night! 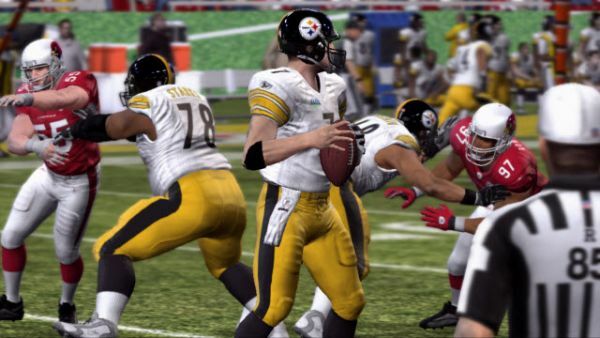 Updated graphics and animations as well as new gameplay engines, including a new blocking system have been included to make Madden 10 the definitive football game of this gaming generation. Page created in 0.8206 seconds.